Zoey is the most beautiful parts of both her parents, Boris and Bella. 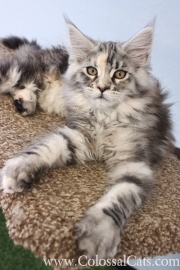 She has a larger size than Bella because Boris is so huge, she has beautiful black and silver coloring with fawn patches, and the most amazing lynx ears and fluffy tail. Her hair is between long and silky like Bella’s and shorter and fluffier like Boris’. She is very chatty and loves to play up high on shelves and trees.